Children in the Soviet Union would probably not have classified millet among their favourite types of porridge, but it was often impossible to avoid eating it. Any child in the Soviet Union knew there were several options for porridge: buckwheat, semolina, oats, rice or millet. You knew that if you played your cards right or were just really lucky you could get your favourite porridge more often and stay away from the porridge you didn't like. My favourite was semolina and buckwheat with milk and sugar. Occasionally granny would try out millet porridge with pumpkin, but I didn't like pumpkin (shameful fact) and didn't care much for millet. Maybe my vague dislike was influenced by a famous (in narrow circles) story about my great-grandmother and millet porridge. My great-grandmother told it, and then my grandmother and mother repeated it, so I learned it well. The events in the story occurred around 1910, when my great-grandmother was 7. Her family was doing very well, as her grandfather was the owner of a few glass factories near Kiev. He even won the state tender to make 250ml vodka bottles called “merzavchiki” (bastards). Munya, the name by which we all knew her and the name that was actually given to her by a passport official who misspelled her real name, which was Mindl, was at a restaurant in Baden-Baden with her parents. She was brought millet porridge, a meal she apparently wasn't all that excited about, and at the sight of it she got up on her chair and yelled out: "I, Mindl Maisil, daughter of Israel Maisil, to eat the food chickens eat? Never!" and sat back down. Granny says that the waiter wondered if he should bring birch tree porridge, meaning a switch, which was greeted with even more protest. Later, during the Soviet era, Baden-Baden was long forgotten. Munya's grandfather went broke not long before the revolution, and eventually she had to warm up to chicken food. 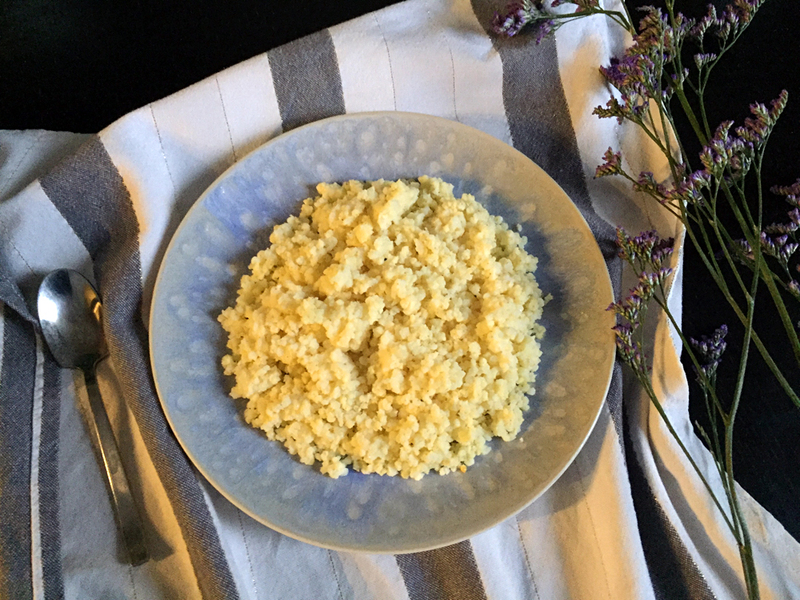 Millet porridge was popular outside our family, too: a friend of granny's remembers that during or just after World War II, her mother would make millet porridge "with raisins" for her brother and leave it with the neighbour who fed him after school. The boy loved raisins and was excited to have the porridge, which had just a few raisins at the bottom of the plate, only to get him to eat. Raisins were expensive and their mother could only afford a few per plate, but they did the trick! Granny’s friend Galina Vassilyevna, who grew up in a village, says that during Lent they ate a "soup" consisting of millet and water only. Sometimes they would add onion fried in hemp oil (hemp oil was widely used in Central Russia where there weren't any sunflowers). Outside of Lent they would also add pork or chicken fat. They would put millet into fish soup for its rather neutral flavour. A special occasion meal, karavaytsy, was millet porridge pancakes (oladyi), covered in a mix of eggs, sour cream and butter and roasted in the oven. Since the oven was the only way of cooking and was lit in the morning, by the evening it was cold, and food was eaten cold in the evenings, since there was nowhere to warm it up. I have come to enjoy millet porridge now and I think it deserves a place in the list of porridge options, especially with pumpkin, so I might add more chicken food (for my soul!) into my diet from now. Wash the millet. Put the water in a pot with the salt and bring the water to a boil. Cook, stirring occasionally, 15-20 minutes. When the porridge thickens, cover it and put it in the oven for 40-50 minutes. Serve with butter and sweetened condensed milk.